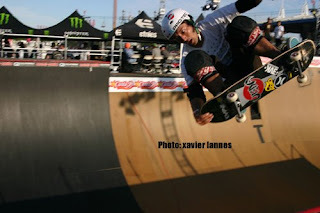 I Skate, Therefore I Am: Maloof Money Cup. Part one The Vert sesh. Several years ago, The Maloof Brothers, of the reputed Palm’s Resort and Casino, wanted to get into the skateboarding business so they teamed up with Rob Dyrdek and World Cup Skateboarding to promote the biggest and best skateboard contest of all time. They picked the perfect time and the perfect place to throw such an ambitious event in the sports history: right in the middle of the Orange County Fair on the opening weekend. Granted, nowhere is skateboarding bigger and more alive than in SoCal. With such a big event at hand the obvious team to design and build the perfect course would be none other than California Skateparks (CS) a company choosed because of their reputation for building the best skateparks in the world. CS said they would be happy to build a skatepark for the biggest skateboarding competition in the world, with only one condition, that the skatepark would have to be made completely out of concrete. "What’s so strange about that," you might ask. The skatepark would have to be built in five days used for three and then be torn down immediately after the contest! It is definitively a veritable heresy to any street skater in the world to build the best street course ever and destroy it after only 3 days of use, but to some skaters, it uphold the anathema “skate and destroy”. Well, maybe when CS and Maloof teamed together, they created the perfect storm for the perfect contest. Stars, stars, stars! 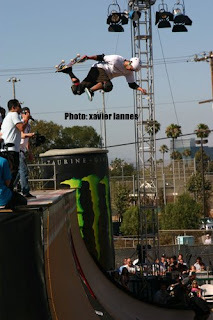 That was the feeling at the 2nd Maloof Money Cup organized by Etnies at Costa Mesa, Ca on July 10-11-12. The magnitude of The Maloof Money Cup was not limited to the biggest prize wallet in the history of skateboarding – $450,000 in cash; amongst the best skateboarders in the world a couple of others stars also showed up: the Maloof brothers, the multiple sponsors (mainly Etnies, Zoo York & Monster), the vert ramp, the mini-mega and the giant rail and the concrete street course. DJ Pooh was there, for any of you fans of the movie Friday, an old Snoop performed several old songs, Terry Kennedy showed up in a mask, maybe an Homage to MJ or just swine flu paranoia, and Kobe Bryant and madam his wife escorted to his seat by a complete crew of the OC Sheriff's dept. in arms among a powerful roar in the assistance. 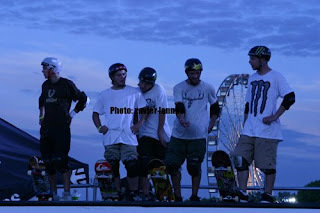 And obviously there were the skateboarders from all over the world who made it all an extraordinary event. The vert finalists were Bob Burnquist, Bucky Lasek, Rob Lorifice, Pierre Luc-Gagnon, Andy MacDonald, Alex Perelson and Adam Taylor, while the street competition was disputed among Mark Appleyard, Dennis Busenitz, Chris Cole, David Gonzalez , Nyjah Huston, Greg Lutzka, Sean Malto, Torey Pudwill, Peter Ramondetta, Paul Rodriguez, Tommy Sandoval and Ryan Sheckler. Of course a lot of TV stations were there and especially Fuel TV who webcast most of the action and all the finals on Sunday evening. During non action time, Fuel TV , already had footage of the street prelims held the day before ready for viewing on their website. The cameramen also had to follow some weird order: “Ok guys when you're not filming skating, film hot chicks" – and this is an actual quote from the lead guy. Needless to say there were actually more hot chicks than hot skaters. And they were smelling better too, so the cameramen were running full throttles with no time to wander around. The Maloof contest was pretty much a giant best trick jam featuring the best skateboarders in the world and it was divided mainly into 3 themes: ramp, street and ladies street. Of the three themes, oh, well, the ramp was definitely the best of the best. 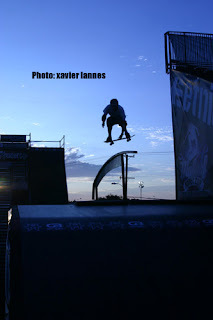 The ramp was made of two different parts: a mini-megaramp which featured a 35-foot roll-in ramp leading to a 25-foot gap with a gigantic flat-rail with a gigantic rail U-shaped half pipe.The “Megaramp” is not a new item in the skateboarding world. Danny Way’s earliest concept, already a decade ago, was a monster tools for immense air jumps and, since then, variations of this gigantic structure have popped up in all sorts of mainstream events all over the world and have been a permanent fixture at the X Games since 2004. The rainbow rail over the gap was made famous by Bob Burnquist who grinded it on his way into the Grand Canyon abyss. Bob is now the proud owner of his own private Megaramp, built in the backyard of his home in San Diego County. The real novelty in the 2009 Maloof Money Cup was the introduction of a scaled down version – the mini-megaramp – which connects to the half-pipe through a tunnel so skaters can keep on going with their line of tricks after dropping in and sliding the giant rail. However, that is theoretical as during the first two days there were lots of mishaps and most skaters finished sliding of their knees or buttocks down to the big half-pipe after ripping on the rail. By the third day, the vert competition was split into a rail-only session followed by the typical vert session into the half-pipe. 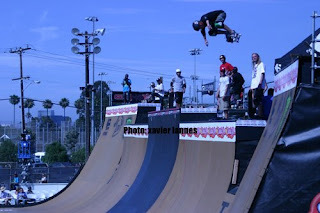 In the contest format, skateboarders competed in segments or heats, utilizing the entire apparatus, and finished with two 25-minute heat sessions in order for each skater, followed by a twenty-minute free-for-all jam session which allowed for the best to shine. This jam format is different from other competitions were routines are usually timed. . It is not a surprise that Pierre Luc Gagnon and Bob Burnquist were favorites. PLG was pre-qualified as he was the winner from Maloof 2008. But that did not hinder him from rehearsing his acts in advance the day before. Then, in the finals, he attacked the rail with back lips and crooked nose grinds, and smoothly rolled the ramp with an amazing variety of soaring 3- and 5-spins and transfers to-and-from the offset extension. 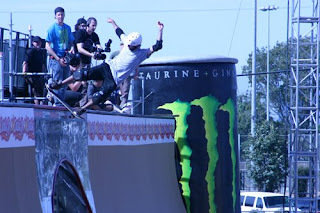 Bob Burnquist played a significant role in the design of the entire vert structure so he was at ease in his ramp. He qualified first on Saturday’s semi-finals and preforming switchstance knacks, he virtually melted the rail with tricks like fakie-to-fakie 50-50s and 270 back lips and, in the ramp, pulled huge flip indies, one-footed back smith over the bridge and his very own Burntwist (a s/s eggplant three). Then meet Alex Perelson, a young underdog, the son of a San Diego heart surgeon and new star of a vert-skateboarding universe long dominated by aging veterans. Alex Perelson is only 18. He is humble and polite an he is not really powerfully built, Though he had been showing a routine packed with reputable tricks (extended back 3s, lofty tail grabs, feebles and front lips in the rail), Alex Perelson made vert exciting again. 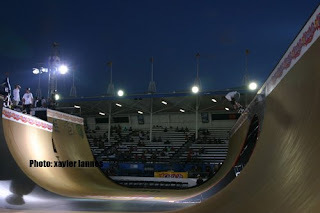 Young Alex was placed a low sixth in the semis, and had plenty of challengers to overcome: Andy Macdonald, Bucky Lasek, Rob Lorifice and Adam Taylor (not to mention Bob and PLG). And on a sweltering Sunday afternoon at the Maloof Money Cup in Costa Mesa, Young Alex became only the fourth person ever to land a 900-degree rotation at a major competition and stuck it as everyone in the arena went utterly wild, throwing in the air everything at hand: balloons, caps, POP material, tee shirts, wife... After that 900, it wasn’t much of a guess who would be the winner. The 900, which is 2 1/2 spins above a vertical wall with skateboard underfoot, was one of many tricks Perelson stuck while en route to an unlikely triumph over established superstars Pierre Luc-Gagnon (second) and Bob Burnquist (third). In doing his amazing 900, Perelson joined Brazil's Sandro Dias, Italy's Giorgio Zattoni and iconic Tony Hawk as the only people to have nailed a 900 at a major competition. Xavier Lannes July 14, 2009. The New Powell Viedo is "Fun"